Recently, I did some reading on new software releases. Last week, a new version of Gnome was released which was not unexpected, considering the fact that Gnome has the aim to release a new version every six months. 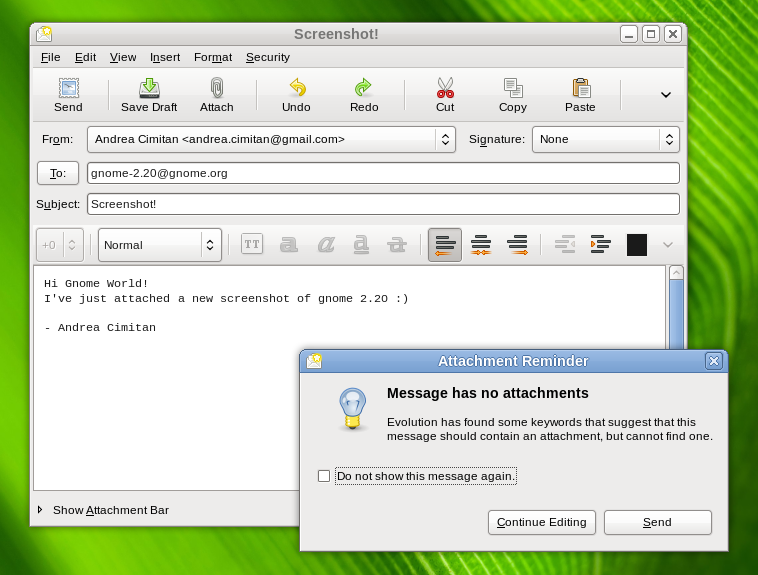 Gnome 2.20 does not contain revolutionairy features, but has some nice improvements. One improvement I like is the notification that the e-mail client Evolutions give when it thinks the user forgets to add an attachement to an e-mail. When an e-mail contains words indicating that the mail should contain an attachment, the system gives an warning that the user possibly forgets to include the attachement. Another useful improvement (not mentioned in the release notes) is the drag-and-drop functionality between File-roller and Nautilus. I think this kind of features are very important to get Gnome accepted by the general public. A nice addition to the list of applications that are available for Gnome is Cheese, which is a clone of the Mac OS X application PhotoBooth. Earlier this month, MySQL AB, the company behind the open source database MySQL, has released the second alpha version of MySQL 6. This upcoming version of the database system contains a new storage engine, called Falcon. This engine’s aim is to replace InnoDB as default storage engine. The company which developed InnoDB was bought by Oracle in 2005 and I think MySQL don’t like the idea that its main product is based on a storage engine developed by one of its competitors. Falcon is developed by Jim Starkey which became an employee of MySQL when it bought Starkey’s company Netfrastructure. Starkey has researched some important technologies for database engines. While he was working for DEC, he was the first to implement multi versioning concurrency control (MVCC) and triggers. These technologies were integrated in InterBase which later became the basis for the open source database engine Firebird. Falcon has some nice features, such as an advanced caching system, support for ACID-transactions, and row-level replication. It would definately give MySQL a enterprise ready storage engine, but they first have to finish it. Currently, according to preliminary benchmarks, the performance of Falcon is worse compared to InnoDB when storing and retrieving BLOB-data. But the potention is definately there, considering the fact that Falcon is still under development. However, MySQL has the target to release the final version in 2008, which may be a little optimistic. I wrote an article of Falcon for Tweakers.net (Dutch). SCO has applied for Chapter 11 bankruptcy protection, which means the company can reorganize without having to fear from its creditors. It is very intersting to read that Darl McBride, SCO’s CEO, now blames Linux for the bad financial position the company is in. As many Slashdot readers already points out, SCO – formarly known as Caldera, was a Linux distributer. But it stopped selling its Linux solutions when it decided to accuses Linux developers from ‘stealing’ code from Unix and use it in the Linux kernel. Until know, this claim is never proven. According to SCO, Linux distributors were aggressively targeting Unix vendors and as a result SCO is now almost bankrupt. I think this company gets what it deserves. You are currently browsing the Martin @ Blog blog archives for September, 2007.